Fall conjures up pumpkins, beautiful reds and golds in nature, and cool weather. Well, much of that is more in theory than reality. What we also get with the start of fall is this brief quiet period – after the craziness of summer vacations and school starts and before the madness of holiday visits, parties, and gifts. Sanctuary Spa invites you to capture this moment and Fall in Love with us…with feeling your best…with glowing skin….with beautiful brows…and a relaxed body! We offer many tips and insider insights on our social media sites, we encourage everyone to sign up to Like our Facebook page (facebook.com/SanctuarySpaHou) and Follow our Instagram feed (instagram.com/sanctuaryspahou/). In the month of October 2018, send us a direct message, call or email us to let us know you have started following us and provide your social media username. Once verified, we’ll add $10 spa dollars to your account that can be used over the next year towards any services or products at the spa! Want a quick sneak peak of what we have to offer at Sanctuary Spa? Keep reading! 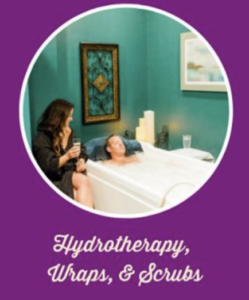 Fall is the perfect time to indulge in some relaxing, renewing hydrotherapy. We offer three rooms for hydrotherapy, each targeting different types of relief. Our Infusion Tub is a great stand-alone service or as preparation for a massage. Picture your personal jacuzzi with soothing jets and hot water. Increase your relief by choosing one of our four elixirs of dead sea salts and essential oils: Relaxation, Lymphatic Drainage/Detox, Sports, or Skin Softening & Hydrating. Learn more here. Looking for some more action in your service? Our Vichy Shower is an all encompassing experience. We have a comfortable massage table in the room where you’ll lay as a our Vichy shower, a row of 6 shower heads, rains on your body. Fall is a wonderful time to slough off the old and reveal shiny, glowing skin, and our scrubs offer that renewing exfoliation. We also perform our wrap services in this room. Wraps are a great service to hydrate and rejuvenate your skin, as well as improve your metabolism. Our wraps offer a meditative aspect too, so you can truly be mindful about your time and commitment to yourself and your health. 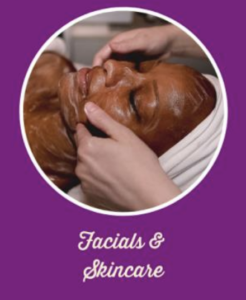 Sanctuary Spa offers the best facials using natural products. We understand everyone’s skin is unique, so we customize our services to exactly what is concerning you about your skin today. We offer an in depth guest consultation so that you have the opportunity to express to your esthetician exactly what you’re looking for, whether it’s just a relaxing spa facial or addressing specific concerns related to acne, rosacea or fine lines. We also have more advanced skincare options including Microcurrent (to re-educate your facial muscles and truly address fine lines), LED (to provide great antibacterial support for acne prone skin or address fine lines), Microdermabrasion (to address hyperpigmentation or dry skin), and our Oxygen Facial (to get you red carpet ready!). Whatever your concern or goal, Sanctuary Spa is here to partner with you and provide amazing services. Admittedly not the most fun services within the spa, they are arguably the most necessary. 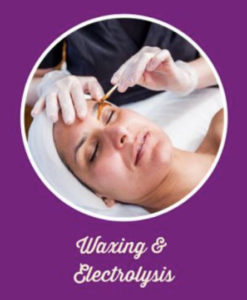 We offer waxing services for all different body parts, male and females. A step above, we offer complimentary aromatherapy, a relaxing atmosphere and of course hot tea or prosecco as with all of our services. Our estheticians are trained to give you the most efficient service to give you great results minimizing any pain. We also provide tips to make sure you have the best after care so that you’re next service will continue to give you great results. We also offer electrolysis, the only FDA approved permanent hair solution. Depending on your hair type and growth cycle, you could get rid of unwanted hair in as few as 4-8 visits. Imagine the savings of no longer having to buy shaving supplies at home and the ease of not worrying about is there stubble on your way out the door! My favorite and the services that everyone can enjoy! At Sanctuary Spa, our educated massage therapists are able to t ranslate your voiced concerns and your body’s muscle tension, into a massage that is just right for you on that day. Recognized by Houstonians in the KPRC Houston Hearts contest for the Best Massage, we offer a Sanctuary Signature Massage in different time increments. Featuring aromatherapy and hot towels as standard and offering upgrades such as a Knesko Diamond Face Mask or Hand and Foot Treatment, our massages are a treat for everyone. As much time as you can commit to, is what you need. 75 minutes and above are amazing experiences! We invite you to fall in love with Sanctuary Spa this October. Ensure you have taken care of yourself before the days get hectic and short. 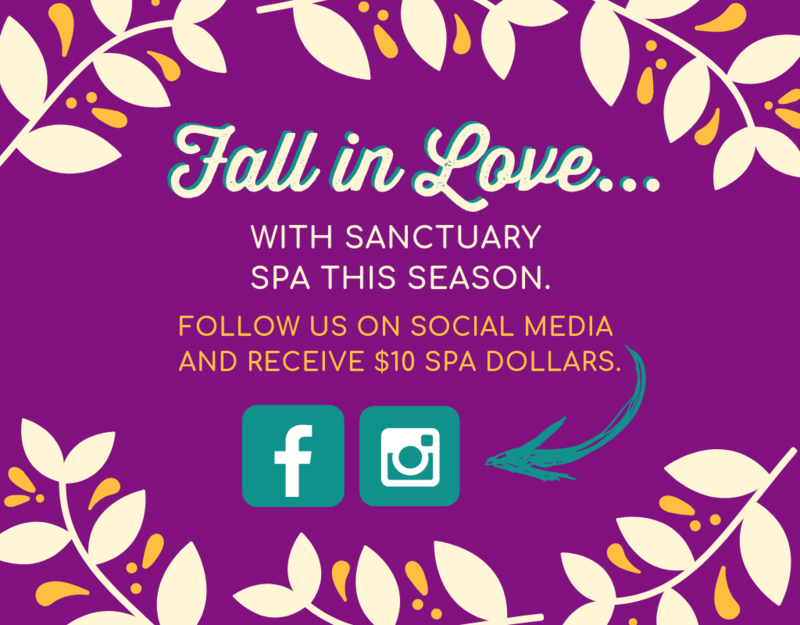 Like our Facebook page (facebook.com/SanctuarySpaHou) and Follow our Instagram feed (instagram.com/sanctuaryspahou/) so that you can see all the amazing services we offer and get to know us more. Even better, tag us on your next visit to the spa for a chance to be featured on our social media profiles!